First let me begin by offering my respectful obesiences to all the Vaisnava devotees of the Lord, who are so merciful to the fallen conditioned souls that they put themselves in perilous and austere conditions of life voluntarily, in order to help others. And as always, let me offer my most humble obeisances to my beloved spiritual master A.C. Bhaktivedanta Swami Prabhupada, who is very dear to Lord Krishna, haven taken shelter at his Lotus feet. joy and devotion. And of course there was Tamal Krishna Goswami, so powerful a personality, you just couldn't 'say no to Tamal'. And my dear friend 'the rascal' Gurudas Swami, who tricked me into shaving up and traveling on the bus for the next year by promising to introduce me to George Harrison "the Beatle". 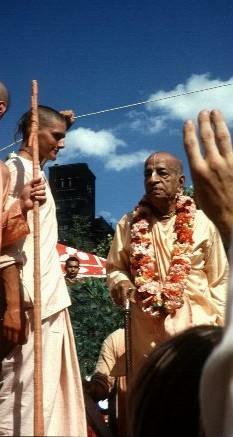 But I love him dearly because through his cunning trickery, I instead got to meet His Divine Grace Srila Prabhupada. And Gurudas was a gifted storyteller, and could entertain devotees and guests alike for hours with his gifts of "Prabhupada Katha". Yes, what a wonderful cast of characters. And in spite of the overcrowding, and the austere living conditions, we were a happy family. The morning prasadam was always relishable, the Srimad-Bhagavatam classes and morning kirtan was always enlivening, and the spirit of comradery was infectious. In short, they were some of the happiest days of my life. the process of Krishna Consciousness, simply by acting in Krishna Consciousness. It was so sublime. So simple! The whole process of Hari Nam Sankirtan, going out in our dhotis with shaved heads and tilak, and chanting, passing out prasadam and books, is by far the most effective ways to attract others to this great movement. It was nice to hear someone chanting along, or watching them take their first meal of prasadam, but even more blissful was putting a book in someone's hand. It was Srila Prabhupada's books that gave me the highest taste of Krishna Consciousness, and helped me to understand the philosophy. So I guess in retrospect my transition into book distribution although not voluntary, was a natural progression. When Jayananda das bramachari, as he was known then, used to drop me off with a couple boxes of books and magazines to distribute, I would complain almost every day. "Oh please can't I stay back and just chant and read today? I'm really in Maya ya know." He would just laugh and hand me my lunch sack, and tell me that distributing Srila Prabhupada's books will be more pleasing to him than me sleeping all day with my bead bag in hand. And he was of course right. Although my fear to go out and approach strangers was very real, as soon as I did, following the instructions of my authorities, I was cast into a world of bliss. I would hand someone a Bhagavad-Gita and turn to the nice pictures and point out that this is Krishna, and this is my spiritual master Srila Prabhupada, I was immediately thrown into another dimension -- the spiritual realm. Hours would fly by and before I knew it the Sankirtan van was pulling into the drop-off spot and I was greeted by the most beautiful sight in this material world, my god brothers. 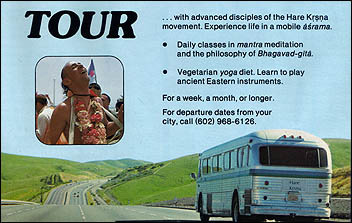 We would share the prasadam that Jayananda Prabhu always seemed to have with him, and have a nice kirtan in the van on the way back to the bus, where there was usually warm milk waiting. How we managed to all live together under one roof seems improbable, taking bucket baths and baths under a garden hose in the dark of night, sleeping on the ground under the bus or on the roof of the bus or all huddled inside on cold and wet nights. But service to Srila Prabhupada, being an instrument in His mission, was so rich and satisfying, we hardly noticed the hardships. And to all my god brothers who had to put up with me, please forgive my offences. Some of you will remember me as Bhakta Buck, others will remember that Srila Prabhupada gave me the name Vyasasan das when I took initiation from him, but most of you will remember me as the guy most fallen, always in Maya, never taking this mission seriously, and always hungry for huge plates of prasadam. In some ways I haven't changed very much at all, I am still hungry for huge plates of prasadam.